my pointless: entire village rescued from flash flood danger. or not. entire village rescued from flash flood danger. or not. Last week a parish council in England took decisive action to spare the inhabitants of a village from flash floods. The council issued an order that 6-year-old Daniel Johnson (pictured right) and his father, Rob Johnson must cease and desist from building dams in a nearby stream. The order was written by the parish clerk and sent to the Johnson home. The writ stated that the Johnsons "repeatedly" rebuilt dams in a 2-inch-deep stream near the village. Why were these dams (see picture) a problem? Because the dams pose a threat of creating possible flash-flood conditions in the village. Said, Mr. Johnson, 'It's just ridiculous. 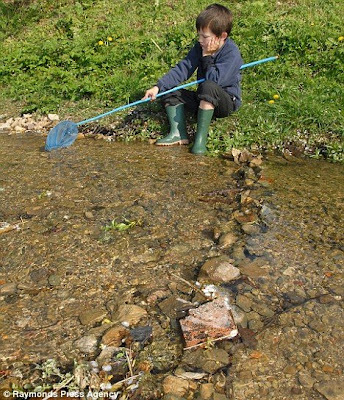 This is about a child being supervised by a parent playing in a stream two inches deep. 'We have made pebble dams a few times. It's stuff you do with your kids. It is normal everyday activity, something people do all over the country. 'Daniel doesn't make proper dams - it's just a few pebbles in a row that the water flows around."